This program offers the options most frequently requested by customers, including serial numbering, dual password and custom logos. With a minimum order of 50 pieces, the program delivers precisely what your organization needs. Protect from WannaCry variants. For added peace of mind, anti-virus protection is available on DataTraveler Vault Privacy 3.0. Powered by ESET NOD32® Anti-Virus Engine software, it’s easy to deploy, with no installation required. Protect from malware / ransomware, viruses, spyware, Trojans and other Internet-borne threats. Protect from WannaCry variants. Options available to let you or your IT experts centrally manage drives to meet compliance requirements, remotely reset passwords, manage device inventory, enforce policies and more. Available through our partnership with DataLocker. Solutions include IronKey Enterprise management for IronKey drives and SafeConsole management for DataTraveler encrypted drives. Noncompliance can lead to loss of public trust and strict oversight or costly class-action lawsuits, and for companies that work with government agencies, noncompliance can disqualify them from working on government contracts. Government agencies can use Kingston® IronKeyTM and DataTraveler® encrypted USB Flash drives to access data from anywhere. Federal law enforcement personnel can review and update case files in the field, while scientists, analysts and forecasters can access data sets from any location with a PC or tablet. With these trusted Flash drives, contractors can work at agency offices while still having trusted access to data and agencies can maintain operations during disasters by putting critical data in the hands of key personnel. For easy remote management, IT professionals can enforce access and use policies from a central console. IT can demonstrate best effort to comply with new and unsettled regulations, including the General Data Protection Regulation. It’s vital for hospitals, healthcare providers, insurers and pharmaceutical companies to take the risk out of mobility and to simplify HIPPA and GDPR audits. With Kingston IronKey and DataTraveler Encrypted USB drives, doctors can securely and easily access patient data from anywhere. Temporary medical and pharmaceutical personnel can gain trusted access to applications and records when on assignment or working from home. Clinical trial contributors, managers and auditors can securely enter or review trial data at any location with a PC or tablet, while insurance claims adjusters, examiners and investigators can have unlimited access to records. Organizations can provide their key personnel with critical data to maintain operations if severe weather or other disasters strike. The IT department can enforce access and use policies from a central console and demonstrate best effort to comply with new and unsettled regulations, including the GDPR. The cost of failing to comply with those regulations is significantly more than the cost of compliance. And failure to comply can impact your business when employees can’t work efficiently. Kingston IronKey and DataTraveler Encrypted USB drives can help financial teleworkers safely access data and applications from home. Banks, insurers and others can equip contractors to work in the field without investing in notebooks or tablets. Auditors can gain trusted access to sensitive data when on assignment or when working from home. Claims adjusters, examiners and investigators can have access to data and applications from the field. In case of severe weather or other disasters, organizations can provide key personnel with access to critical data to maintain operations and the IT department can enforce access and use policies from a central console. Case in point, Heathrow Airport in London (October 30, 2017) uses Unencrypted USB Drives for its non-cloud storage. Unfortunately, they were not standardized on Encrypted USB drives. Get eight useful tips to help your organization keep confidential information confidential and to comply with regulations. Getting a handle on the slipperiest drives. Do your employees and visitors who connect to your network ever use USB drives? See a side-by-side comparison of these two popular data encryption methods. Understand the difference between compliance and protection and what each means for your organization’s USB data storage strategy. USB drives can turn up anywhere - putting data at risk. How can IT deal with these risks, without completely forbidding USB drive usage and all its convenience? All Kingston encrypted drives use XTS encryption, which provides greater data protection over other block cipher modes such as CBC and ECB. View the line up of Kingston’s line of DataTraveler and IronKey Encrypted drives to see which is right for you. A full range of password policies can be changed remotely, using IronKey EMS or SafeConsole. Employees can be negligent when using drives, thus putting sensitive data at risk. Establishing and enforcing policies defining the acceptable use of drives can help. 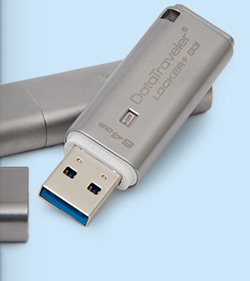 Kingston DataTraveler and IronKey drives use digitally signed firmware which makes them immune to changes to firmware that can allow a USB to become a host agent. Passwords can be reset remotely or in person with IronKey EMS or SafeConsole. Overall, Kingston / IronKey Encrypted USB Drives prove to be the best solution in reliability, compatibility and security for portabledata protection solutions. Issued by National Institute of Standards and Technology (NIST), FIPS validation entails coordinated requirements and standards for cryptography modules. By meeting the FIPS standards, Kingston and IronKey encrypted drives assure purchasers that they meet the criteria assigned.